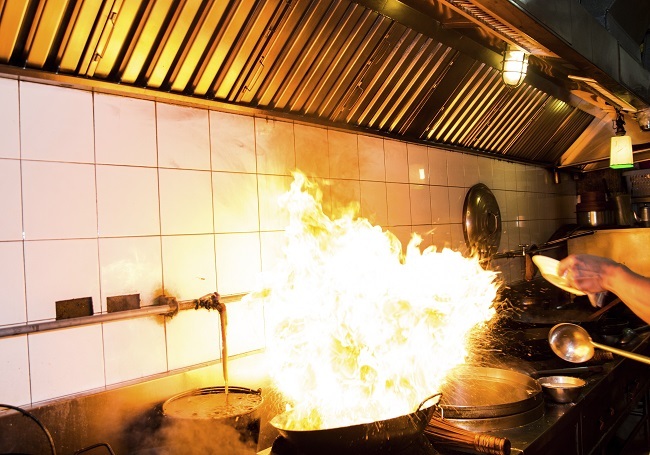 Use these fire safety tips to protect your restaurant. Restaurants tend to have a significantly higher fire risk than other commercial buildings. In fact, it’s all the hot temperatures, flammable cooking oils, and the hectic nature of a restaurant kitchen that end up leading to a potential devastating grease fire. As a result, having the proper fire protection plans in place can be a lifesaver. Here is some crucial information for building owners to be aware of when it comes to restaurants. One of the most important key features of a commercial system is having a proper exhaust system to vent all the cooking fumes and heat outside. In fact, there is something to be said about making sure that grease particles never build up around the hood of a kitchen- particularly commercial kitchens. Commercial fires- specifically kitchen fires requires fire sprinklers. In fact, having sprinklers in the dining area of a commercial restaurant will work to extinguish any potential fires that may start or spread in that part of the actual restaurant. For the best fire protection systems in restaurants, there is really nothing better than investing in the proper emergency lighting in your home. In fact, it’s possible for a fire or other emergency to actually cause a power outage in the facility. This will leave all your patrons stranded in the dark. As a result, investing in emergency lighting in the dining area is a great way to ensure that everyone occupying the space can see how to safely evacuate. At the end of the day, there is nothing better than having a staff that knows exactly what to do in a fire emergency situation. In fact, cleaning all the cooking and food preparation surfaces thoroughly to make sure that the kitchen is cleaned and organized. This entry was posted on Monday, January 14th, 2019 at 4:25 pm. Both comments and pings are currently closed.